Since we’re only ONE MONTH away from New York Fashion Week, I’m already dreaming up fabulous outfit ideas to take with me! I’ll definitely be bringing my new Kirkwood pumps, this necklace you saw on my Instagram (obsessed! ), and my Chanel bag, but I need some pretty basics that will be prime layering pieces to go with my leather leggings and other such things. This ruffle-hemmed top is #1 on my list right now. It comes in three colors and is simple, but beautiful, don’t you think? I’ve never been that concerned with buying luxurious products for my hair since it typically doesn’t do what I want it to anyway, but I’m seriously considering investing in more Oribe. I’ve tried out the thickening spray and it’s amazing, but I also want to try this shampoo and this conditioner. Any Oribe fans out there? Do you think I should try it? I’m definitely buying this purse-sized pack of sprays for my trip to New York next month – perfection! Have you guys visited Anthropologie lately? They currently have the most incredible selection of jewelry (most of which is under $100). I recently picked up the double pearl necklace mentioned above, these crystal-clustered studs and this layered bronze pearl necklace. All gorgeous, all under $75! Click here to check out all of the pretty pieces available. The ruffled hem top is my favorite, so pretty. Ahhh, that striped dress is EVERYTHING! So many pretty things – this post has me seriously craving spring! Great picks!! Love that swim suit! Thank you so much for stopping by my blog and commenting!! Means so much! cannot wait to see how you style that pear necklace, such a cool piece! I need #6! And I just got those Elizabeth Cole earrings and I love them! That ruffled top is so pretty, love the sheer detail. Beautiful roundup! Great picks! Numbers 1 and 10 are my faves. Great picks, as always! Will have to check out Oribe’s thickening spray for my fine locks. SOOO jealous you’re going to NYC! Enjoy! You will look gorgeous in all of these picks! stop it. these lists are just making me want a beach and warmer weather!! LOVE all your picks – those flats are too cute. I wish I could own those shoes! And loving all your jewelry picks! Ahh.. I can only dream about putting on that adorable bathing suit right now! Okay, so I love this post! I’m a BIG Anthro fan. And the Valentino flats I tried over the weekend while at Nordstrom, love them. Great picks! Love those earrings! I have been dying over everything in blush pink. This makes me want to be on vacation! So many amazing things this week!! That ruffle hem top is amazing. And the striped flats are too cute! I love it all. Wish I was headed to Fashion Week too!! Those PJs + that ABS dress = swoon! 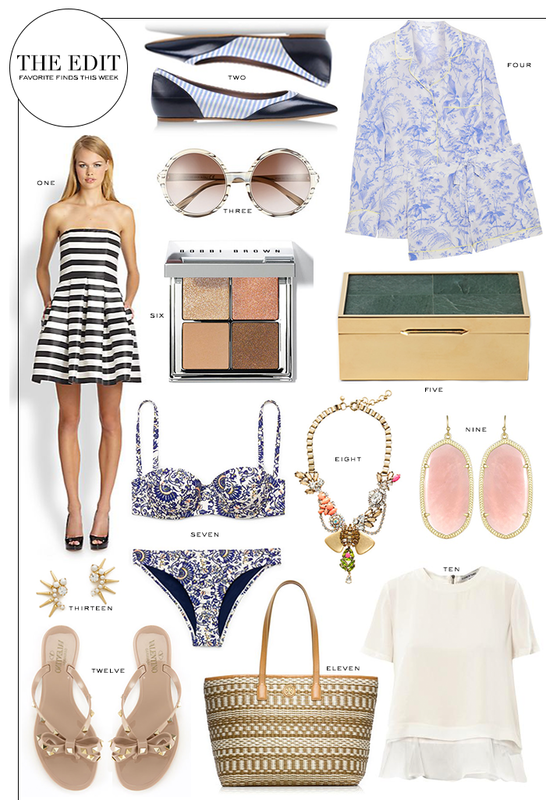 Ahh this roundup has me craving warm weather asap! I loove those silk pjs! Love!! Would love to have some of those items added to my closet as well.